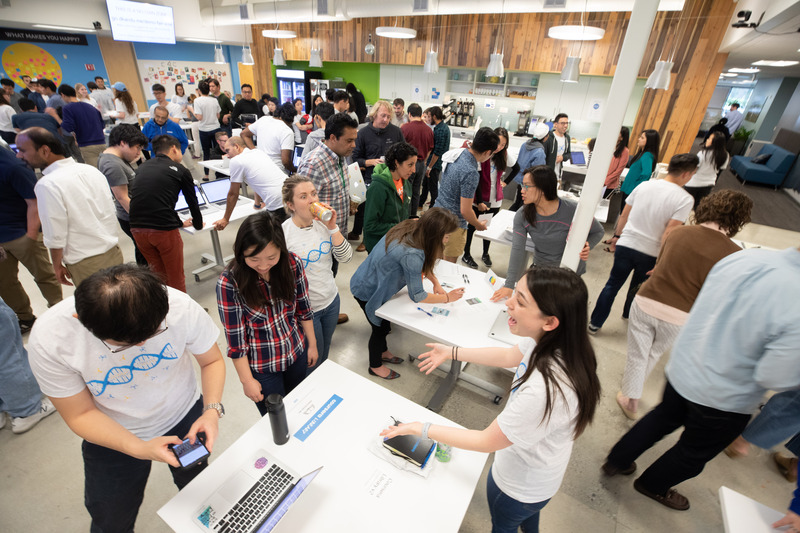 In the last couple of weeks, Coursera celebrated two incredible milestones — our sixth birthday and the tenth rendition of a company-wide event dubbed the Make-a-thon! Over the course of a week, people from across the company (and in some cases, from across the globe!) came together to share their ideas about what would make Coursera a better place to be. In the end, over thirty projects involving over 100 Courserians were presented to the company at large, culminating in an epic showdown for the “Best in Show” award. Yes, this was taken by a drone! We welcomed our first overseas pitch from across the pond at our London office! We had our first project pitched by a member of the external Coursera community! Cool Tools, a project to productionize Postman request collections for use by Coursera implementation managers won the Betterment award. 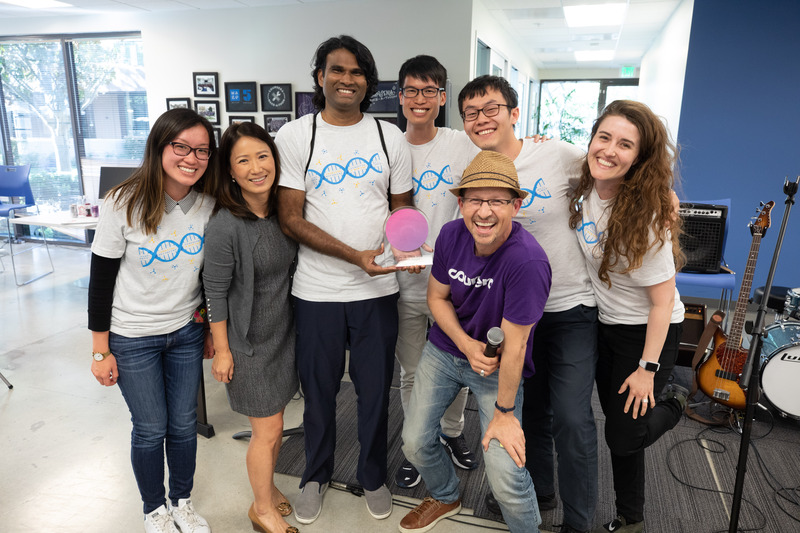 This Coursera Life, an internal podcast showcasing a day-in-the-life of various Courserians throughout the company, took home the Deep Honesty award. Camp Coursera, a cross-organization project intended to bring folks together into “cabins” to give them the space and opportunity to talk and be supported, won our Solidarity award. Share Your Certs, a project intended to make it easier to display and share your Coursera certificates, won the Boldness award as well as the Best in Show award. But what is the Make-a-thon, anyway? 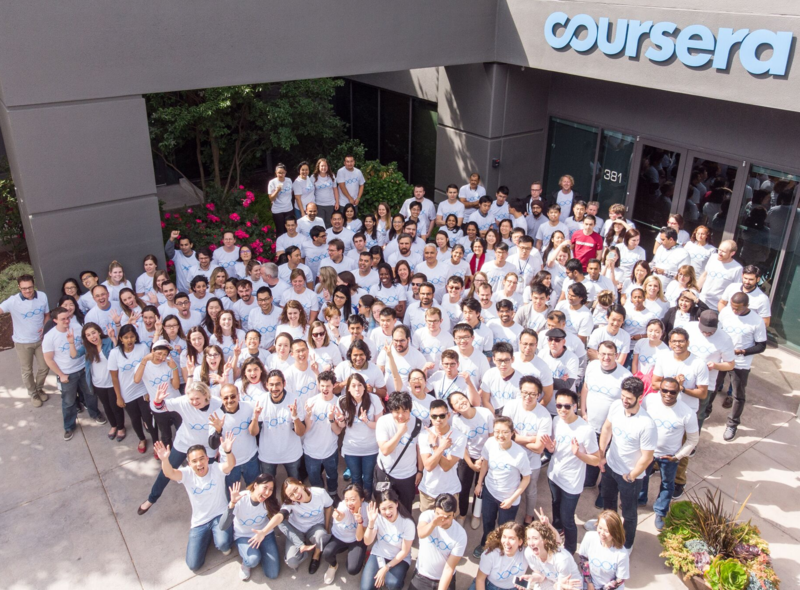 We’d love to share with you a little bit of the history and intent behind the event, and how that has shaped the growth of Coursera over the years. This made me a little sad; here we were with a close-knit, motivated group of folks, and no outlet for their creativity! On top of that, with two separate offices it was clear that there was a need for some way to bridge the gap, a way to pull folks together regardless of their job function. In an email addressed to two of my teammates, I detailed an event similar to a hackathon, but without the connotation of an engineering-only event given that fully half the company was non-technical. That email was titled “make a thon”. Two months later, myself and two other volunteers were hosting the first Coursera Make-a-thon. Even though we only had two days to actually make things, we ended up having almost four hours worth of demos at the end of it all. It was clear that that we were onto something interesting! The music video we created from our first Make-a-thon featuring both employees and the learners we serve. Over the last few years, we’ve honed our event organizing chops and gotten it down to a science (who wants to sit around for four hours straight?!). We kick-off the event with a group pitch session the week prior to the Make-a-thon, giving folks the chance to sit and let their ideas stew over the weekend. Finally, we bring it all together with a Demo Fair (like a science fair), giving folks the opportunity to create their own adventure, explore the different projects and discuss their ideas. We vote on the things we think should show up in the final presentation round in front of the entire company, and finally, we present awards for the projects that best embody our company values (Boldness, Betterment, Solidarity, and Deep Honesty) and the coveted “Best in Show” award. What has come out of the Make-a-thon? 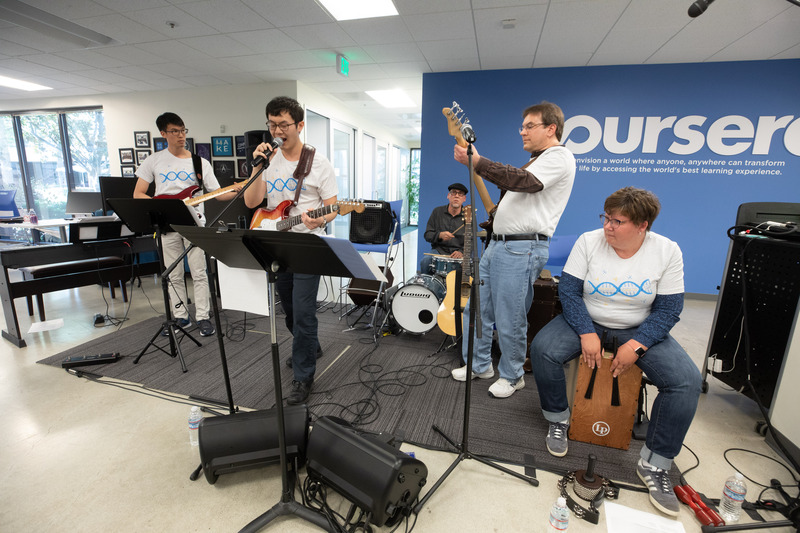 Some of the most important parts of Coursera culture and product have come out of the Make-a-thon, including the Coursera Band (from the 8th Make-a-thon), the interactive transcript that sits below every lecture on Coursera (the 4th Make-a-thon), and of course, the Coursera for Refugees program (the 5th Make-a-thon). Of course, those are just some of the highlights — many more parts of our culture and business can find roots in a small idea or project from the Make-a-thon. The event provides us a very intentional space to explore new avenues, inspire one another, and really become makers. That spirit continues after the event as well and helps drive innovation in other aspects of the company. So, what is the Make-a-thon? To sum it all up, the Make-a-thon is a creative, inclusive, and empowering event designed for people throughout the company to have the time and space to work and a place to dance and create. It is a distillation of the strong entrepreneurial spirit of those who work here, and a true reflection of who we are as a company. The Make-a-thon is run by a committee of dedicated individuals throughout the company; with representation from almost every team at Coursera, we come together to help run a fun and impactful event. With the support of the indomitable Facilities and IT teams, this committee drives the entirety of the event from start to finish, ensuring that we have an event that is for us, by us. Without their hard work and dedication, none of this would be possible.